SOCKS: Borrowed from my mam. POINT OF FASHION: Kathy Seldon. So yeah, a cheap as chips outfit. I love home-made costumes, they just seem more loved and you have a chance to be creative. Jan Penchan Ho from Gumnaam. That's How You Know from Enchanted. You Make My Dreams from (500) Days Of Summer. And my favourite number from Singin' In The Rain is All I Do Is Dream Of You, but YouTube won't let me embed it - boo! In other news, Craig (he is no longer 'The Boy' since we've now broken up, but still very good friends) told me that I'm in this month's issue of The Crack, which is a free magazine in the North East about arts, culture, music and the like. I love it, so that's rather amazing. If anything goes up on the website, I'll of course link you guys too. Right, I'm off to the party. I'm going to look a right plonker on the metro. ah i love jaan pehechaan ho! it puts me in such a good mood doing that dance! great costume, have a fun night! yellow and the black/white polka dots! so amazing! and such a cute umbrella!! What an awesome outfit. Hope you had a fab time. I saw tap shoes in a charity shop today and totally wanted to buy them but had no reason to. 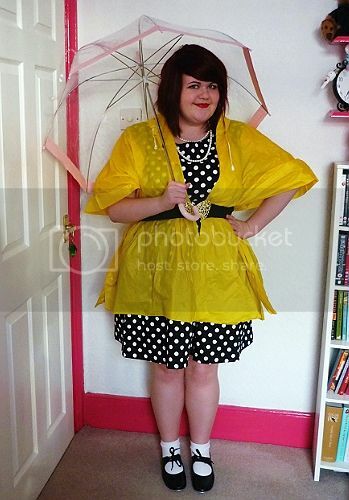 You truly do know how to go out in the rain and looking ever-so-stylish. The umbrella and poncho are just perfection. Also I am loving the dress up, the shoes and socks - too cute. The outfit is perfect, you look the part but you look pretty trendy too. You'd brighten everyone's day if you went out like that in the rain. beautiful outfit! i love that 500 days of summer dance sequence haha. Ooh, I love dressing up too! You are too cute! You look great - hope you had a fab time! You look absolutely fantastic! Hope you had a great time at the party! K.M. : Me too, I just love it! ingrid: Oh yes, Ghost World is one of my all-time favourite films. I was so like Enid as a teenager! Gazel: Hehe, in Newcastle it rains a lot so you have to dance around to cheer yourself up! Fushball: Who is this Tom character? Your manchum? And I haven't worn socks and shoes like that since I was a bairn, so it was really fun. Bethamint: Awww thank you!! :DD That's so sweet of you to say. And I only really like Matalan when their new collections come out as they sell out in bigger sizes incredibly quickly, so you have to be snappy. Helen: Thank you, I do too - It's my dream for everyone to suddenly start singing and dancing randomly. L: Me too, I love it so much. I even saw it on stage last year, which was just wonderful! Rebequita Rose: Hehe so many people I know dread costume parties - I LOVE putting outfits together and assuming a character, you can be so creative with it. Wow, you're adorable!!! You look great. I LOVE this outfit. 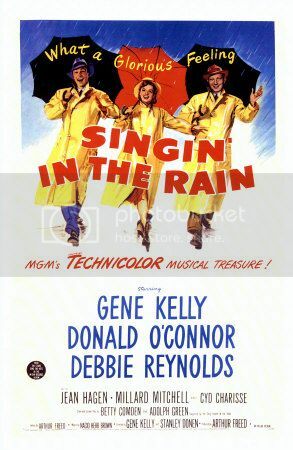 I love it even more because it was inspired by Singin' in the Rain - one of my favourite films of all time. I've watched it so many times with my mum I think we could recite the whole thing. "And I caaaaaaaaaaan't staaaaaand him." "AND I CAAAAAAAAAN'T STAAAAAAND HIM"
That outfit is as cute as!! !